Śrī Thirumaḻisai Āḻvār was born in Thirumaḻisai, the village that is located in the metropolitan city of Chennai. It is recorded that the Āḻvār was born in Magha Asterism in the Taishya month (January-February) in Dvāpara Age. Śrī Thirumaḻisai Pirāṉ is considered as the manifestation of Sudarśana Chakra, the holy discus of Śrīman Nārāyaṇa. The legend has it that Āḻvār was born to the sage Bhrigu and his wife when they were in the Mahisara Kṣetra which was considered very holy place and most conducive to contemplation for ascetics and as such recommended to them by Brahma himself, in the previous Yuga (Dvāpara). When Sage Bhrigu's wife gave birth, after extraordinary 12 months, the foetus was not well developed. So it was abandoned in the field under the shade of some bamboo trees, thinking that it would not survive. However the Lord had a different purpose altogether for it and instilled life into it. The foetus began to grow and when it became a fully mature infant and opened its eyes, the Lord favoured it with the vision of His resplendent Form removing its thirst and hunger. It is said that once the vision of the Lord vanished, the child began to cry. A woodcutter found the crying baby, and took the child to his wife. The child had no wants for food due to the Lord's grace. Many in the village wondered about the strange child from the field. It is said that an old farmer and his wife recognizing the divinity of the child, began to bring some milk for the child daily and the child took to their love and began to imbibe the milk. One day the child did not completely consume the milk. The farmer's wife drank the remainder of the milk and she became youthful and in due course conceived a child from her husband. The offspring of this couple, a spiritually oriented child named Kanikaṇṇaṉ in his later years became the disciple of the Āḻvār himself. I was not born in one of the four Varṇas. and do not recite the Vedas with my tongue. I have not conquered the joy given by the senses. and I have no refuge except your shining feet. Śrī Periyavāccāṉ Piḷḷai interprets this to mean that Āḻvār was not raised among the high classes. Āḻvār identified himself to the lowly family of the woodcutter who actually raised him as opposed to his birth in the lineage of a sage. This is compared to Lord Krishna who considered himself as a cowherd being raised by Nanda and Yaśodā in Gokulam. Thirumaḻisai Āḻvār born of the sage became a yogi himself at a very early age. He learnt and tested for himself all the different systems of thought and faiths both Vedic and non-Vedic. It is said that he was in deep meditation in a cave near Thiruvallikeni for several years. The Early Āḻvārs who were great sages themselves at the time are said to have visited the divine Āḻvār. It is also believed that Thirumaḻisai Āḻvār became a disciple of Śrī Pei Āḻvār. There is certainly a traditional Guru and disciple relationship that one can see even today at the shrine of Śrī Keśava Perumāḷ and Śrī Pei Āḻvār in Mylapore. Śrī Pei Āḻvār apparently showed how one could easily waste away all one's accumulated powers particularly when unfocussed comparing this to watering a tree planted upside down with water carried from the well taken in a pot full of holes. For him as well, Parabrahman, the transcendental reality was not an abstract formless entity but the most personal Śrīman Nārāyaṇa with all the glorious and auspicious attributes. appears verbatim in the Irandam Thiruvandhadhi of Śrī Bhutattāḷvar being the verse number 11. These and other common features noted between their works confirm that they were contemporaries and they must have influenced each other and also shared similar views and thoughts. It is said that even Lord Śiva tested him and impressed by his immense and utter devotion to Śrīman Nārāyaṇa gave him the special title of "Bhakti Sāra", meaning, "The Quintessence of Bhakti ". Āḻvār has an indirect reference to his encounter with Rudra in Nāṉmukaṉ Thiruvandhadhi where he tells Śrīman Nārāyaṇa that he does not worship anyone else but Him, and he further says that Rudra will stand as a witness to this assertion. While Thirumaḻisai Āḻvār lived in Kānchīpuram, it is said that an old lady did menial work in his Āshram keeping it clean and tidy. Āḻvār pleased with her devotion blessed her with beauty and youthful look. The ruling king of the time apparently falling in love with her beauty and youth got married to her. After some years, the king began to grow old and showed signs of aging and greying, while his wife remained ever youthful. He found out that her beauty and youth were the result of the blessing of the Āḻvār. The king at the advice of his wife tried to get to the Thirumaḻisai Āḻvār by obtaining the goodwill of Kanikaṇṇaṉ, the disciple who often came to beg alms from him. When Kanikaṇṇaṉ came on his usual routine, the king begged him very much to bring the Thirumaḻisai Āḻvār to his court so that he could pay his homage. Being the disciple of the Āḻvār who loudly declares that he would never sing on humans with his tongue it is but natural for Kanikaṇṇaṉ to refuse to sing the praise of the king. When Kanikaṇṇaṉ would only sing the glory of the Lord Supreme, the king ordered him to be banished from his kingdom. The disciple hurried forth at once and related duly the incident and his punishment at the hands of the king to the Thirumaḻisai Āḻvār. "Kanikaṇṇaṉ is leaving this place. O' Sapphire hued Lord of the beautiful Kānchī, Do not lie down. The courageous sweet tongued poet that I am also going to follow. You also roll up your serpent bed!" It is said that the Lord immediately departed with His devotees. Kānchīpuram became bereft of richness and beauty due to lack of divinity in the sanctum and several disasters began to occur. The king hastily summoned his ministers to inquire into the cause of the disasters. They all pointed out his follies. He then at the behest of his ministers went and prostrated at the feet of the Āḻvār. Āḻvār out of compassion forgave the king completely. It is said that Āḻvār then requested the Lord again to return with them to Thiruvenkata and spread His serpent bed. The Lord enshrined in Thiruvenkata temple is in an unusual lying posture with His head on the left side (to our right side as we see Him) to indicate the fact that He once got up at the bidding of His Bhakta. With the return of the divinity to the shrine, came back all the joy and richness to the land. Āḻvār refers to the grace and easy accessibility of the Lord enshrined in Thiruvenkata in verse 36 of Nāṉmukaṉ Thiruvandhadhi and verse 63 of Thiruchanda Virutham. He apparently rested in an outside bench in a house when he arrived in that village. The Brahmins who were practicing chanting of Vedic hymns, stopped the chant feeling that the sound of the Vedic hymns (Veda Śabda) should not fall in the ears of one from a lowly caste. Āḻvār recognizing the reason for their stopping the chant, moved away from that place. The Brahmins however forgot the lines which they were reciting. While they were struggling to remember, the compassionate Āḻvār helped them to recall the lines indicating to them by signs. The Brahmins felt ashamed having failed to recognize the greatness of the Āḻvār. While the Āḻvār was still in the same village, the Lord enshrined in the local temple apparently was moving its head always facing the direction where the Āḻvār was located. The people who noticed this strange phenomenon, hurried forth and reported this to the Pundit who was then performing a Yāga (Vedic fire ritual). The priest immediately felt happy that a great mahatma has been found and he went immediately to Āḻvār's place and was overwhelmed by the brilliance radiating from the Thirumaḻisai Āḻvār. He brought the Āḻvār with great respect to the fire ritual sanctuary and paid all due worship and offered the first honours. The conductors of the ritual however got very annoyed and reproached him and blamed him for making their ritual futile by bringing a low caste stranger and conferring the first honours to him. The pandit was very upset at the behaviour of these Brahmins and begged the Thirumaḻisai Āḻvār to reveal his greatness. Staying inside as Thou art, show Thy hidden Form." And to surprise of all there appeared Śrīman Nārāyaṇa Himself carrying the Discus and the Conch along with Ādiśeṣa and Mahālakṣmī on Āḻvār's own body. Seeing this everyone present there, were entranced. 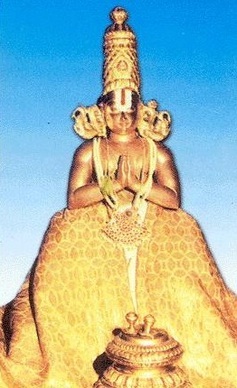 It is said that Thirumaḻisai Āḻvār spent several years in contemplation of the Divine. One of the most famous holy shrines associated with his life is Śrī Arāvamudan's temple in Tirukuṭantai. Āḻvār spent apparently seven hundred years in meditation at Tirukuṭantai. It is also said that he spent most of the later part of his stay on this earth in Tirukuṭantai. Did your feet hurt when you walked with Sita in the forest? and dug up the earth and brought out the trembling earth goddess? where the river spreads into many channels. Get up, come and speak to us. We praise you, O Keśava. Thirumaḻisai Āḻvār entreats the Lord to get up from His bed and speak to Him. It is said that the Lord actually began to get up whereupon the Āḻvār pleased to know that the Lord was actually not tired, immediately uttered words of benediction so that the Lord as enshrined there would remain safe for a long long time. One is Thiruchanda Virutham with 120 verses and Nāṉmukaṉ Thiruvandhadhi with 96 verses. It is said that Āḻvār threw all the manuscripts of his works into the Cauvery river and these two manuscripts floated against the stream.. Even today one can see the Vrindāvan and a beautiful shrine where Āḻvār is said to have had his Āshram in Tirukuṭantai. The holy shrine of the Āḻvār also exists in his birthplace Thirumaḻisai where the Lord enshrined in the temple is Śrī Jagannātha and the divine mother Lakshmi is Thirumangai Piratti.